HYDE PARK — It’s safe to check out the new Whole Foods again: the 40-minute wait just to get inside the store had dropped to 10 minutes by 10:30 a.m. on opening day Wednesday. The store at 5118 S. Lake Park Ave. opened at 8 a.m. Wednesday and was offering gift cards ranging from $5 to $50 for the first 500 customers, but visitors were still willing to line up around the block even when they didn’t expect to catch the promo. “I like Whole Foods and I wanted to see what they have and whether it’s the same as the other Whole Foods I go to,” said Karen Jackson, who drove up from Chatham and waited 20 minutes in line to get in the doors. Jackson missed the big rush earlier in the morning when lines stretched from the entrance on Lake Park Avenue around East Hyde Park Boulevard and down Harper Avenue to 52nd Street. 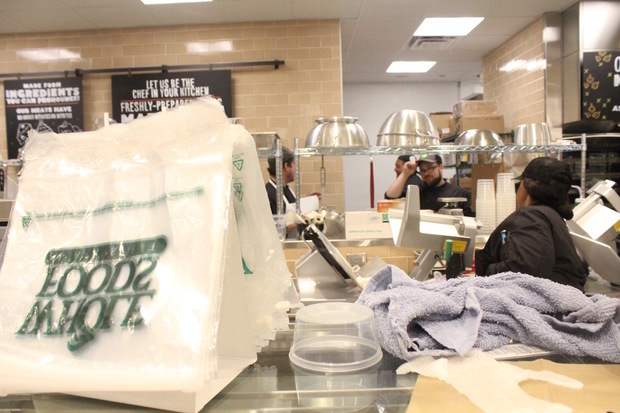 The store's opening has been hotly anticipated in the neighborhood, and people drove up Wednesday morning from Chatham, South Shore and other neighborhoods just to get a glimpse of the first Whole Foods deep on the South Side. Joanne B. of South Shore said it’s been frustrating to have to wait until the end of President Barack Obama’s second term before retailers noticed his neighborhood. “We had to wait for him to almost be out of office before they saw it,” she said. 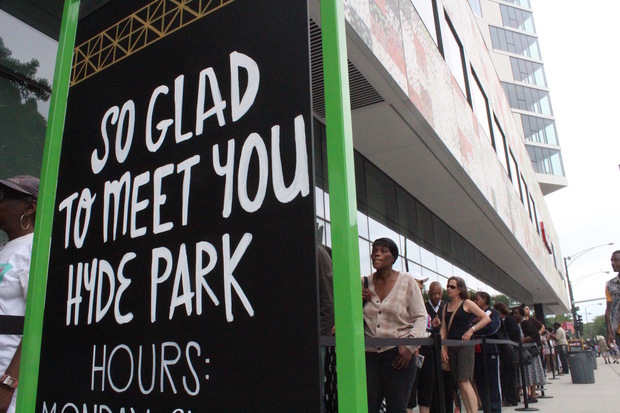 Mayor Rahm Emanuel skirted the crowds on Tuesday to come and check out the new store. 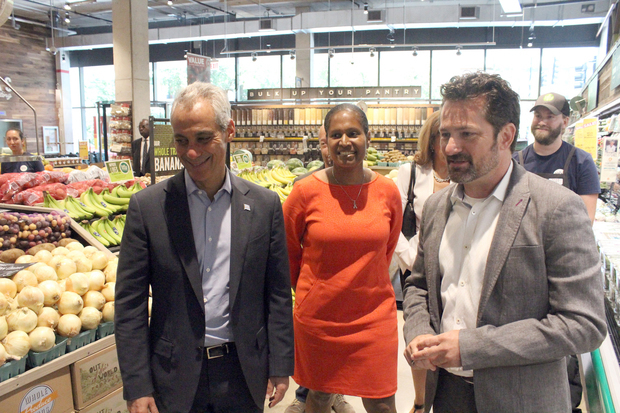 “Whole Foods has answered the call to be in all parts of the city,” Emanuel said during a press conference at the store Tuesday afternoon. He praised the store for stocking items from more than 100 local businesses and said he was anticipating the Englewood store’s opening. Emanuel got to see the store as few South Siders are likely to for the next few weeks, empty of customers. The mayor leisurely walked through the empty aisles on Wednesday to check out the fish and cheese counters and chat with the new employees working in the prepared food sections. Whole Foods has said it will hire locals to staff the store, but has not yet released numbers on its progress towards that goal. The store is donating 1 percent of its net sales on Thursday to Blackstone Bicycle Works. Whole Foods is trying to hire from the area to staff the Hyde Park store but has not yet released numbers on its progress towards those goals. Mayor Rahm Emanuel and Ald. Sophia King (4th) visited the new store on Tuesday beating the crowds. How Much Will Obama Library Cost, Who's Paying and What Will Be In There?